Below is an article that discusses the paintings by David Cox in detail. 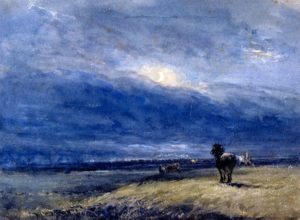 David Cox Paintings have been in the least recognized categories of the British Victorian era. He has painted over 300 paintings which weren’t acknowledged at the time. He was an excellent landscape painter and the master of Impressionism. He was born in Birmingham, England and spent most of his life there. His burial is also in Birmingham. This is an excellent watercolor work by David Cox. The shades of the sky are in perfect syndication with the atmosphere shown in the painting. 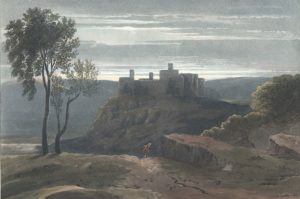 The painting gives a 16th and 17th-century look of the Harlech Castle. The castle is a famous structure in Wales and located near the Irish Sea. The look of the painting is devoid of human influence and portrays gloomy weather yet in an intriguing manner. This is another watercolor painting by David Cox. This was exhibited in the year 1849. This painting is a good example of Impressionism and its dawn from painters like David Cox. The painting shows bright daylight and the well-displayed reflection of the sky in the water of the river is one of the main aesthetics of the painting. The painting also consists of some animal figures where the color scheme is appreciable. Today it lies at the Manchester Art Gallery. 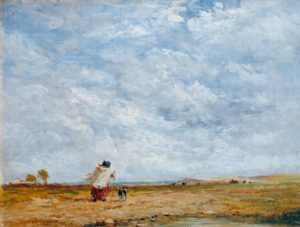 The painting is again a watercolor painting by David Cox in the year 1850. It lies in the Tate Gallery in London. The painting is filled with the perfect shade of the sky in the bright daylight. The ground is a barren land which is empty but a human figure with an animal can be spotted. The painting gives a sense of silence in an afar land. The painting is a watercolor work by David Cox. He exhibited the painting in the year 1849. Today, the painting is in the Birmingham Museum of Art in Alabama. The aesthetic of the painting lies in the portrayal of the sky in vivid colors and the shades of blue along with the subtle light of the moon. The train is being spectated by an animal in the night. The painting can be categorized as a serene display of the time of the night. 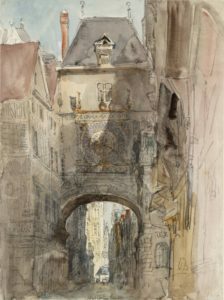 The Tour d’Horloge, Rouen is another watercolor painting by David Cox in 1829. 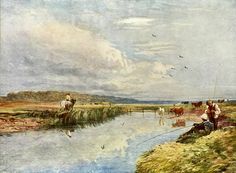 This was when he was at the peak of his career and is regarded as one of the most magnificent of David Cox paintings. Today, the painting is at the Tate Gallery in London and is regarded as a highly detailed watercolor art. The structure is the 14th-century astronomical clock in Normandy. It is also known as the Rue du Gros-Horloge. The detailing of the painting even in watercolor is appreciated. The dimensions of the structure along with the angles of the walls are well shown.